For more refined comfort zones with special demands on architecture and design, with fixed air control blades. With low sound power level for comfort zones, with individually manually adjustable air control blades. For comfort zones, with fixed air control blades. For high rooms, with adjustable air control blades. With low sound power level for comfort and industrial zones, with fixed air control blades. The standard TROX TCS/400 – 600 High-Flow Swirl Diffuser is designed to fit into different T-Bar ceiling patterns as well as plaster board ceilings and is available in either a square or round face plate ranging from 400 x 400 or 400 Dia to 600 x 600 or 600 Dia. The diffuser has a radial airflow discharge pattern allowing for a high induction flow rate suitable for both variable and constant volume flow. With very low sound power level for comfort zones and individually manually adjustable air control blades. With very low sound power level for comfort zones, with fixed air control blades. For horizontal swirling supply air discharge creating high induction levels, with fixed air control blades. 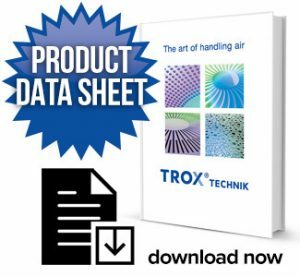 The TROX FD600/24 Swirl Diffuser is designed to fit into a standard 600 mm square ceiling tile with 24 fixed blades and is provided with either a square or round face. It is only manufacturer in ONE size but, it can be supplied with blanking plates fitted to the rear of the diffuser face to reduce the air flow if needed. This diffuser is designed to provide a radial air flow discharge pattern with high induction flow rate. Flexible plenum boxes requiring less transport and storage space. Ventilation and extract ventilation combined in one casing. For large, variable volume flow rate ranges, stable discharge patterns even with small volume flow rates. With wide diffuser face for larger volume flow rates. Slot diffusers with 50 mm diffuser face (nominal width) and adjustable air control elements. The type ESD slot diffuser is available with 1 to 8 slots and is suitable for supply or return air application. The slot diffusers are suitable for use in systems with constant and variable volume flows. The new product type is not only aesthetically attractive but also more energy efficient; plus it offers improved acoustic properties. TROX vent valves type LVS are suitable for all kinds of ventilation systems. Supply air and exhaust air variants are available, according to the prevailing requirements. The volume flows can be altered by turning the valve disk. The AFG Type floor grille is developed to be mounted on raised floor systems to match typical 600mm by 600mm floor tiles, to supply cooling to computer rooms or data centers where cooling load is high. Two different types of sub-frame are available to suit different raised floor systems typically available in the market. This is heavy duty floor grille capable of taking high static load and is robust in construction. B. Static load (Concentrated Load): Tested at 4.5 kN over an area of 25 mm x 25 mm. C. Safety load: The sample was successfully tested at 13.5 kN at the centre of the grille over an area of 25 mm x 25. The above tests were conducted in accordance with UK´s standard MOB PF2 PS/SPU: 1992. The core of the floor grille is in mill finish. the grille can be supplied with either 0° or 15° deflection blade profile. The steel sub-frame below the grille core is painted matt black in RAL 9005 as standard supply. The sand trap louvre is used as pre-filter for the protection of air conditioning plants in areas exposed to extreme levels of industrial pollution. It has a degree of separation of sand and large dust particles, even in cases of high dust concentrations. The centrically arranged sections and holes for sand drainage ensure the sand trap louvre is self cleaning and maintenance-free. The sand trap louvre is designed to separate large particles at low air velocities, thus avoiding excessive dust loading on conventional plant filters. It is not intended as a substitute for conventional supply air filtration plant. The DS rectangular cased attenuator design offers, as standard, many advanced features including aerodynamic splitters and side liners, slide-on flanges and erosion protected acoustic infill covered by galvanized perforated sheet metal. Casing conforms to DW 142 Class B ductwork code. Where preferred, type DK splitters only can be supplied for inclusion in an AHU section or builders work duct. Where required, airway spacer channels can be supplied. Air displacement vent units types QSH and ISH are mainly used in industrial areas with heights of 3.5 to 10 m, installation can be freely suspended or fixed to columns or walls. In rooms or halls with changing thermal loads the supply air temperature can provide either heating or cooling functions and the air itself can be discharged horizontally or vertically. Air polluting work processes suggest the use of the type QSH since in the cooling mode it provides a bell-shaped low turbulence air distribution. TROX vent valves type LVS are suitable for all kinds of ventilation systems. Supply air and exhaust air variants are available, according to the prevailing requirements. The volume flows can be altered by turning the valve disk. The AFG Type floor grille is developed to be mounted on raised floor systems to match typical 600mm by 600mm floor tiles, to supply cooling to computer rooms or data centers where cooling load is high. Two different types of sub-frame are available to suit different raised floor systems typically available in the market. This is heavy duty floor grille capable of taking high static load and is robust in construction. The floor grille was tested independently for: A. Uniform distributed load test at 12kN/m³ B. Static load (Concentrated Load): Tested at 4.5 kN over an area of 25 mm x 25 mm. C. Safety load: The sample was successfully tested at 13.5 kN at the centre of the grille over an area of 25 mm x 25. D. Soft Body Impact Test: The grille did not collapse The above tests were conducted in accordance with UK´s standard MOB PF2 PS/SPU: 1992. The core of the floor grille is in mill finish. the grille can be supplied with either 0° or 15° deflection blade profile. The steel sub-frame below the grille core is painted matt black in RAL 9005 as standard supply. The DS rectangular cased attenuator design offers, as standard, many advanced features including aerodynamic splitters and side liners, slide-on flanges and erosion protected acoustic infill covered by galvanized perforated sheet metal. Casing conforms to DW 142 Class B ductwork code. Where preferred, type DK splitters only can be supplied for inclusion in an AHU section or builders work duct. Where required, airway spacer channels can be supplied. Air displacement vent units types QSH and ISH are mainly used in industrial areas with heights of 3.5 to 10 m, installation can be freely suspended or fixed to columns or walls. In rooms or halls with changing thermal loads the supply air temperature can provide either heating or cooling functions and the air itself can be discharged horizontally or vertically. Air polluting work processes suggest the use of the type QSH since in the cooling mode it provides a bell-shaped low turbulence air distribution.